This is our U.S. Affordable Care Act (ACA) Information Reporting 2016 blog post. If you have questions about 2016 ACA reporting, you can post it here. we are doing our correction run (only 3 EEs left) and in trxn HRBENUS_ACA_EVAL which we run after the 1094-C was printed, the node for EE Status info does not show any data. P.S. I will open and incident. do any of you see issues with the correction process? We corrected 3 SSNs and ran the data collection programs. Now the 1094-C for the new Run ID is checked as ‘corrected’ and there is data past line 18. Both should not be the case since we only corrected 1095-C data. And in the XML trxn we have hence two sets of two XML files, one set for 1094-C correction and the other for 1095-C corrections. We should only see one set. I think it is related to table HRBENUS_D_REPORT having ‘Res. Type’ a ‘C’ again like last year. If I change it to ‘O’ manually, the 1094-C is issued correctly (the CORRECTED flag is not checked and only data through line 18 shows). SAP had a patch last year but it looks like the issue came back. Please open an incident with variants to recreate and we will look into it. This note deliveres some corrections to force replacement scenarios as for example the error message ‘Database entry not found with table key APPL: ACA RUNID: 00000000000000000000′. For those who already have one of the pilot releases of this note, please deimplement it from the system and do the implementation process again as it contains a new version available. We have implemented this note in our development system but the error message ‘Database entry not found with table key APPL: ACA RUNID: 00000000000000000000′. still persists. Any additional thoughts? Did you apply the last version of the note? Did you face any error during the note implementation? Please check the note log at SNOTE transaction and confirm that all the correction instructions were applied and the objects are active. Are you performing a force replacement scenario or a correction one? We are creating a correction file. The note was applied shortly before I sent the message so I assume it would be the latest version. All instructions were applied and all objects are active but we still have the issue. Hi Roger, I know this is an incredibly busy time for everyone but we are quickly approaching our 60 day deadline with IRS to have a corrected file submitted. We first filed on Feb 21st so we only have a few days left. We have opened incident 147138 / 2017 ACA: Corrections File cannot be created and implemented the notes as recommended with no success. Could you possibly take a look for us? Our XML file was rejected due to a schema validation error, AIRSH100. The following messages appear. I tired following the instructions in note 2393903 – ACA How to validate the XML structure but I don’t get the option to validate the files. Has anyone else encountered this error? One possible reason could be improper use of QlfyOfferMethodTrnstReliefInd. Could you please your data file if the node “QlfyOfferMethodTrnstReliefInd” is present? Then check your configuration for line 16 of Form 1095-C (ex. Code 2I is reserved for reporting year 2016). Could someone help us on the ACA filing error while uploading to IRS Site. We are facing the same issue . Were you able to get a resolution to this issue . If so could you please let us know. We have submitted several xml files to the IRS, all of which have been rejected due to multiple reasons. The first files were rejected because of schema validation errors. We applied 2 SAP notes (2410470 and 2419025), validated our schema following IRS instructions, and submitted Replacement files to the IRS. The Replacement files were also rejected due to a Manifest-025 error. I haven’t had any luck finding much documentation on this error, so I contacted the AIR Mailbox, and the instructions that were sent back are extremely technical. Has anyone else encountered this particular error – Manifest ‘ChecksumAugmentationNum’ must match the IRS-calculated ‘ChecksumAugmentationNum’ value of the transmission. If so, were you able to resolve it to successfully submit files? Thanks all. We got a Manifest-025 error when we corrected one date directly in the XML as opposed to regenerating the entire file. All you have to do is generate a new MD5 checksum figure and put it into the corresponding manifest XML for your file. The purpose of the field ‘ChecksumAugmentationNum’ is to avoid to process incorrect information due a change in the content of the XML file. This value is generated by the SAP system during the report execution and it considers all the content from the file. For this reason, if you manually perform a change at the content it will be reject for security reasons. This is an option that helps to prevent attacks called ‘man in the middle’. So, SAP does not recommend to perform changes at the XML file manually as it create a breach and the possibility of the file being reject. I had to change my byte size and check sum because the B forms has “-” in the phone number and I didn’t want to apply all the notes to catch up. I was able to calculate the check sum using this little calculator. I replaced what was in the manifest file with the number it generated and it all worked great! The IRS accepted the file. We have submitted our XML files to the IRS and currently have a status of “accepted with errors.” This morning, I went through the process of correcting an employee on our QA system and producing “corrected” 1095C forms and files. Much to my surprise, when I executed HRBENUS_ACA_XML, it produced two sets of XML files, and they appear to be (at a quick glance) identical. I have asked our basis team to apply SAP Note 2419025 to our QA system and am going to re-run the process, but I was curious if any of you who are further along in your correction process have experienced this. Two sets of XML files could be due to employee classification changes and/or changes to the information on Form 1094-C during your Correction process. If no such corrections/changes were made, please open an incident under PA-PA-US-BN and we will look into it. Thank you. There should not have been any 1094C changes, unless changing the ending date on infotype 0171 would trigger a 1094C change. I am going to re-test again this afternoon and will update the thread shortly. Have you found a resolution for the no EE status information for correction run? We are faced with this same issue and are unable to send our correction file? We get the error Database entry not found with table key APPL: ACA RUNID: 00000000000000000000 when we try to create the XML corrections file. Thanks for any advice or input you can provide. for our issue with the missing EE status information SAP note 2444446 fixed it. But your error looks different compared to ours. Not sure if the note will fix that. I believe my 1094C was also marked as “corrected” as well. I am about to re-test our correction scenario now that we have updated/corrected some PERNRs in our test/QA system. I will update you with the results and whether or not I see data in the node. I believe you are correct. Our 1094C is also being marked as ‘corrected’ as part of this process, even though I am only adjusting data for select employees. So, I think you are correct in submitting an incident for this. I wonder if I need to do the same so it would get more “coverage”? I am going to try one additional test on a ‘clean’ test system (one without a prior production run so I can see if these multiple correction XMLs are created there). In HRBENUS_ACA_EVAL, however, I AM seeing Employee Status Information for my correction run. SAP provided pilot note ‘2444447 – ACA: Incorrect counts in Form 1094-C for Correction’ and I just applied and tested it. Unfortunately the 1094-C is still marked as ‘corrected’ and too much information is provided on the form past line 18. And hence two sets of XML files are generated. We had the similar problem last year and it might still be based on the HRBENUS_D_REPORT table entry for the correction run ID where the ‘result type’ is C. When I switch it to ‘O’ it works correctly. And I see ‘O’ in the correction runs from last year in this table. SAP note 2444447 has been officially released if you want to try it out. Thanks. I am getting it put on now. Once you applied it, did it correct/resolve your two sets of XML files being created for a correction run? yes, that last note fixed the 1094-C and XML problem we encountered. Now we are just waiting for the IRS letter for a password reset…. Glad it resolved your issue. We are still getting two XML files when we attempt to process a correction run after applying this latest note. I may resort to submitting an incident with SAP and see what they say. Thankfully, my HR team is still working through correcting the master data on those employees that kicked out so we aren’t in total crisis mode to get these corrections submitted, but I am most certainly ready to get this done and over with! Al, have you made any further progress on not getting both the 1094 and 1095 XML files for your correction run? No, I have not made any further progress. In fact, our HR team is still gathering all of the required/missing data, so I have hit the “pause” button until they can give me a subset to test with. We recently refreshed our QA system from our PRD system so I have clean data to test with. I have not checked for SAP Notes for a while so I wonder if there are now some additional ones to apply. This problem did not exist prior to us applying all the recent ACA Note Updates. We looked at our old files (prior Notes) and the space was not there. Could you please see our reply to the incident and we will look into it. Margaret/Roger: Would you please look at incident 144368. We got this schema error (from IRS) after implementing all Notes (that were available on March 23). This space happens in this tag for any RunIDs that we generate XML on and it not unique to any specific RunID. This note describes the issue at ‘PersonLastNm’ not being filled when generating the XML Manifest file. Version 1.7 of the SAP ACA User Guide for 2016 is now available in SAP Note 2359091 – Announcement Note for Affordable Care Act Information Reporting 2016. We have submitted two xml files for single ALE to the IRS which were rejected due to Schema validation error with employee data. We have corrected the employee data in SAP and have followed the steps in the user guide for Generation of Replacement Forms and Files. 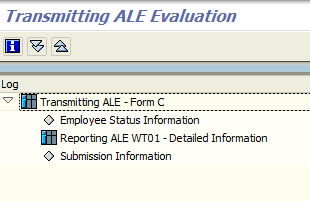 However, when generating the XML file for the replacement, we are missing the ALE member information from Parts II and III of 1094 C in the replacement file. Upon Executing HRBENUS_ACA_PERSON for rejected receipt ID, a new run id was generated and populated HRBENUS_D_PERSON table for original record with new run id and replacement record types. Also, table HRBENUS_D_ADDATA was populated with new Run ID for all records in original run. Upon executing the HRBENUS_ACA_ALE report, some of the ALE fields were created for the new run. Missing following ALE fields for replacement run ID: NAP_COUNT_**, NEE_COUNT_**, NEN_COUNT_**, PTN_COUNT_**, EMP_COUNT_**, EMP_TRAN_CNT_**, FTE_COUNT_**, and FTE_TRAN_CNT_**. I believe the missing fields for the new run ID is the cause for not seeing the 1094 C data in the replacement file. I have not submitted the replacement file because it is missing the 1094 C data. Has anyone else encountered this particular issue? If so, how were you able to resolve it? Please see section 3.8 of version 1.7 of the SAP ACA User Guide for 2016 in SAP Note 2359091 – Announcement Note for Affordable Care Act Information Reporting 2016. This section with provide you with instructions on the Replacement and correcting employee master data process. I followed the instructions for the replacement process, section 3.8 of version 1.7. My issue is that the replacement XML submission does not have any of the employee counts that represent 1094 C Part III. The counts were in the original XML file but are not in the replacement. How do I get the Full Time employee and Total Employee counts in the replacement file? Please open an incident under PA-PA-US-BN with variants to recreate and we will look into it. We have one employee that is being rejected by the IRS and are not sure how to resolve this issue. Employee was a contractor 1/1/2016 – 2/8/2016 and therefore excluded based on our configuration. Employee was hired 2/9/2016 and is reflected as FTE March – December. The XML does not generate an AnnualOfferOfCoverageCd entry since they were not employed full time. In addition, it does not generate MontlhyOfferofCoverageGrp entries for January or February. Has anyone had this issue? If so, were you able to resolve it? We had a similar scenario with 2 interns who became full-time employees (FTE) mid-year. To get the MonthlyOfferCoverageGrp values when they were not FTE to resolve the AIR error, we updated feature UBAIC for the specific PERNR and overrode feature UBAAS for Box 16. Please make sure their master data is accurate. Then ran the Correction process to generate form 1095C for the employees and xml files for the IRS. You may see the 2 sets of xml files that Mathias and Al encountered. We loaded the xml set for the 1095C correction to the AIR system & was accepted. This class doesn’t create correct instance of the following interface for certain retired employees with many assignments. go_employee TYPE REF TO if_hrpayus_employee. We get an error with Info Type 000 stating – Infotype 000 cannot be found. Infotype 000 exists on that particular record. It aims to centralize some ACA issues and their corrections. I am facing an issue with AATS communication testing issue with one of the Tax company. This is the new tax company for the year 2016. We successfully submitted remaining 7 companies XML files to IRS which we did for 2015. I have some doubts. Could you please clarify. In which system (Quality or Production) we need to do AATS test scenario. Could you please send the link for User manual for AATS communication testing scenario. Shall we need to prepare dummy benefit plan and employee for this testing. Please advice us at the earliest. ASUG Webcast: Affordable Healthcare Act (ACA) May,12: Note: Although this webcast was for reporting year 2015, the steps on slides 7-13 are similar for reporting year 2016 that you might find helpful. At present I am facing the below issue. The Issue is as below. [TPE1106] The manifest file does not match our current schema .In particular, our system identified a potential issue with the following elements. irs:EIN and documentSystemFileNm. I have used the narraitves 7 for testing and EIN as per that 0000000710. Could you please advice me to resolve the issue at the earliest. Please recheck your implementation of SAP Notes (make sure that all UDO reports were executed correctly (including the third step, when possible)), configuration (in particular the separate 2015 and 2016 date range in V_T77PAYUS_TXCMP), and implementation of the HR Attributes. With your advice we were able to submit AATS communication file to IRS. The errors are showing as below. Form 1094C ‘Business name’ and ‘Employer EIN’ in Employer InformationGrp must match with IRS data base. Form109495C Transmittal upstream / form 1094c upstream details/ Employer Information group/Employer EIN. I have followed the Narraitives 7 and named tax company as TEST carrtestseven. Please advice us to resolve the issue. Now the error related to Form 1094C ‘Business name’ and ‘Employer EIN’ in Employer InformationGrp must match with IRS data base is rectified. At present while downloading XML files are being saved with TEST prefix, which we were unable to upload to IRS site. IRS system is showing the rejection. Here I am attaching the screens related to the same. The DocumentSystemFileNm in manifest file including Prefix “TEST”. I have maintained the Tax company as TEST with CARRTESTEVEN s details; Mapped the EIN number 000000710 to tax company TEST in EIN to BSI tax company node. Also mapped Tax company to to Tax authorities, Tax types, Employer ID number. Please ensure that you have the appropriate entries as described in the Cookbook AATS Submission 7 document attached to SAP Note 2385115 – ACA: 2016 AATS Scenarios. For example, in the last section Communication Test, step 6 describes the appropriate entries for RPCBENUS_ACA_XML. In particular, please recheck step 6.c. Deselect Test mode. As per Narratives 7, we need to fill AATS TEST SCENARIO as 7; But I did not find field AATS TEST SCENARIO. Some we need to restrict Prefix TEST in the generated Manifest XML file. When you execute transaction HRBENUS_ACA_XML, AATS TEST SCENARIO is the last field on the parameter screen of this report. Thanks For your suggestion. By that, Prefix TEST in the generated Manifest XML file issue was solved. But We are getting another error. Could you please advice us to resolve the error. It could be that you submitted the same file to the IRS again. You can call the IRS to determine the reason for this error in their system. Version 1.8 of the SAP ACA User Guide for 2016 is now available in SAP Note 2359091 – Announcement Note for Affordable Care Act Information Reporting 2016. Just an FYI… today we filed our corrections for the issues detected by the IRS based on our original filing. We received the status ‘Accepted’ and are closing the project now. Thank y’all for the ongoing support! WOW, hooray for you and your colleagues!! I wanted to express my appreciation for the insight, advice and clarity that you have provided over the past 18 months via this blog. I have relied on the knowledge you have shared more times than I can say. I look forward to working with you on future projects, though hopefully they will not be as convoluted, complex or confounding as the ACA :-). Thank you for the kind words! I believe it was a great group effort with all of us helping each other and learning from each other! Your contributions were always insightful as well! Definitely let’s stay in touch for the next challenges. The new EEO-1 reporting change is on the list but still too early to say how it will play out. 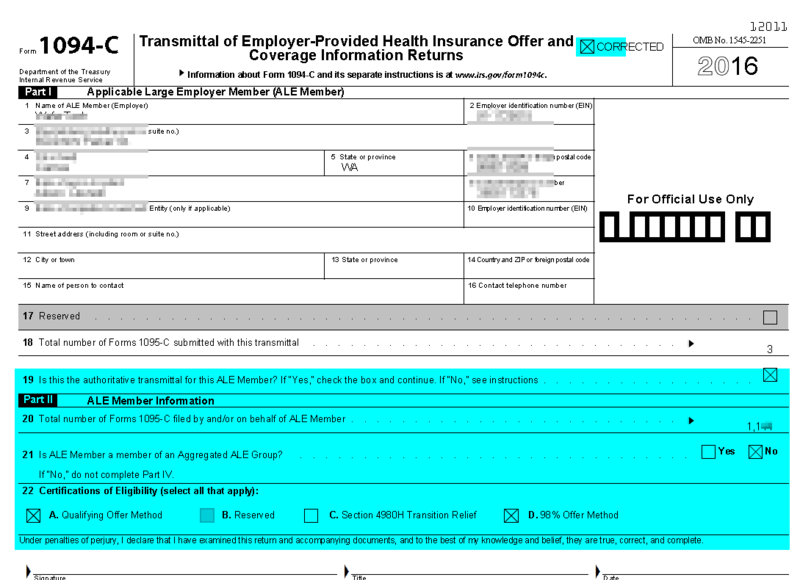 Hi Mathias: I know this is the ACA blog, but since you mentioned the new EEO-1 reporting change, I was curious on how your company is approaching this. Do you know if SAP will release the new reviewed report (which I believe is 3660 fields wide) and are you waiting for that? We just kicked off the project and are looking at 3 options (homemade Excel report, 3 party payroll (PY) provider support, SAP’s enhancement of the EEO-1 report). I am hoping for the SAP report but we do not have the W-2/W-3 data in SAP but rather our PY system. Time data we do have in SAP. Not sure yet how to merge the data. Curious, where did you see the ‘3660 fields wide’ specification? I contacted the team responsible for the form they will consider this suggestion in the next reporting year. We appreciate your feedback, this really helps us to improve the solution delivered. A new SAP JAM Group will be launched tomorrow (September 1). Therefore, the link to access it will be released also tomorrow. Please take a look at this blog post to access the new Jam Group. Note: Once you have joined the SAP JAM Group: SAP ERP HCM Benefits Management USA, join the Subgroup or Discussion Group ‘SAP ACA 2017’ to begin collaborating. Thanks for letting me know. Looking into this, will get back to you. Please see updated instructions above.